Shortly after the Lemelson Center opened Spark!Lab at the National Museum of American History in November 2008, we started receiving inquiries from museums, libraries, community centers, and individuals from across the country. Most had visited Spark!Lab with their family or had heard of it from a friend or colleague and wanted to know how they could get a Spark!Lab in their city or town. The reasons varied—from declining schools to museums in need of fresh programming to community centers wanting quality after-school programs for young students—but the message was clear: Spark!Lab offered a fun and innovative educational approach to STEM and creative learning, and offered opportunities for kids and their families to engage in the invention process. Hands-on invention activities at The Discovery. I’ll admit, the first few phone calls were pretty flattering and more than a little exciting. But when the calls continued and our floor staff began to relay similar messages from Spark!Lab visitors, I realized that we were onto something. It seemed that Spark!Lab might be able to fill the needs of institutions beyond the Smithsonian. So we began to develop plans to take Spark!Lab outside of Washington, DC, and to create the Spark!Lab National Network. Like many ambitious projects, the Spark!Lab National Network didn’t take shape overnight (despite my sincere wishes otherwise). First, we had to figure out if we could even lend our content and the Smithsonian and Spark!Lab names to a non-Smithsonian entity. (According to the Smithsonian’s Office of General Counsel: yes!) Then we had to consider how we would run a project like this while still maintaining our presence at the Museum. How would we ensure quality and consistency of experience at labs we didn’t directly manage? How would we select locations for Spark!Labs? How much would a Spark!Lab cost and what would that fee include for our collaborators? Perhaps the most important question, how could we work with staff at our satellite locations to build their capacity for developing their own Spark!Lab activities and, collectively, become better at encouraging inventive creativity in all of our respective visitors? 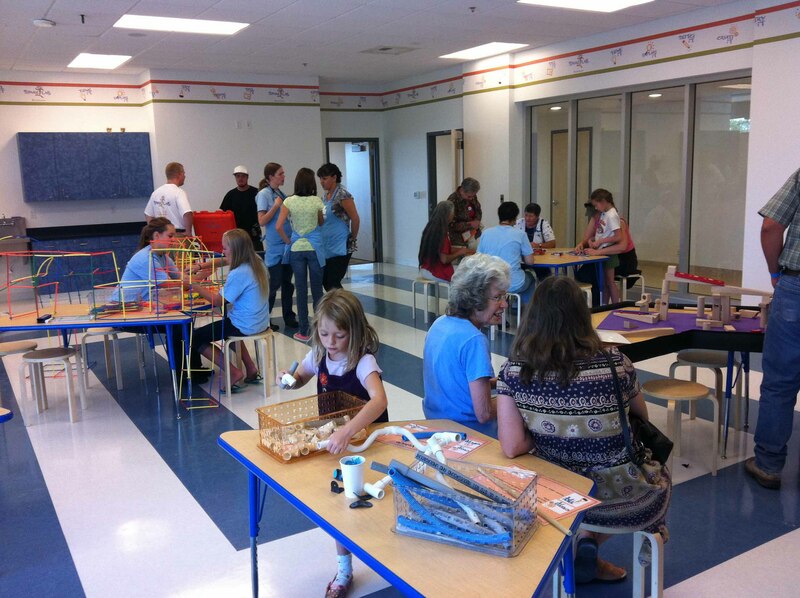 The first Spark!Lab off the National Mall opened in September 2011 at the Terry Lee Wells Nevada Discovery Museum. 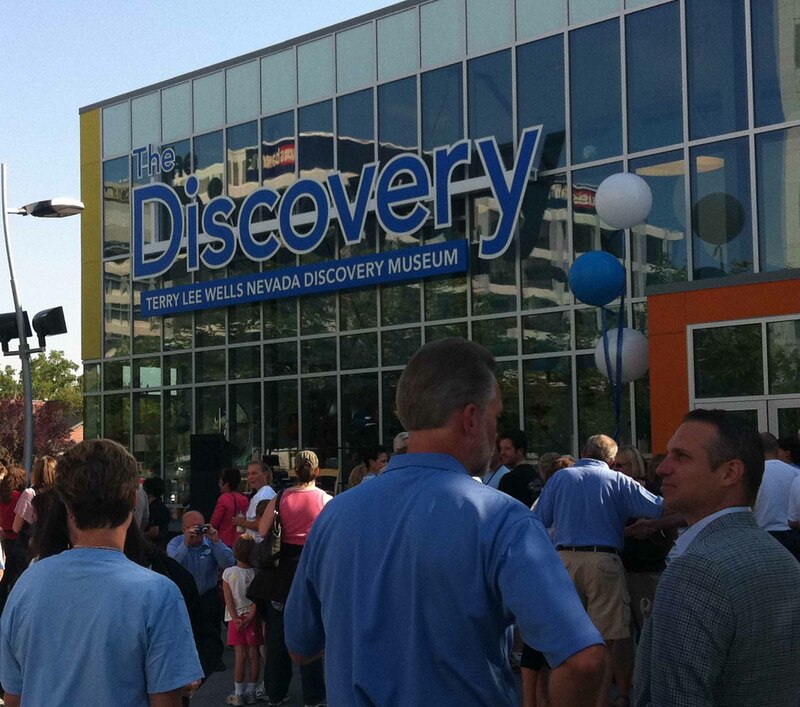 Fast forward to September 2011, and we celebrated the opening or our first Spark!Lab National Network site—a prototype of sorts—at the Terry Lee Wells Nevada Discovery Museum in Reno. Spark!Lab at The Discovery has provided incredible learning opportunities for everyone involved. For the Lemelson Center, it has helped shape our thinking about all sorts of things, from training to activity development to communication strategies to marketing opportunities. It has really laid the groundwork for the expansion and development of the Network. And thanks to a generous gift from the Ford Motor Company Fund, this expansion is in the works! Their gift, announced at the Washington Auto Show in late January, will provide funding for us to expand to three additional US museums. It will also provide much-needed support for the design of the new Spark!Lab at the National Museum of American History, which will open in 2015. Ford Donates $500,000 to the Smithsonian — Edsel Ford II (standing center), great-grandson of Henry Ford, announces a $500,000 contribution to the Smithsonian National Museum of American History and Lemelson Center for the Study of Innovation for its educational Spark!Lab program at the 2013 Washington Auto Show. 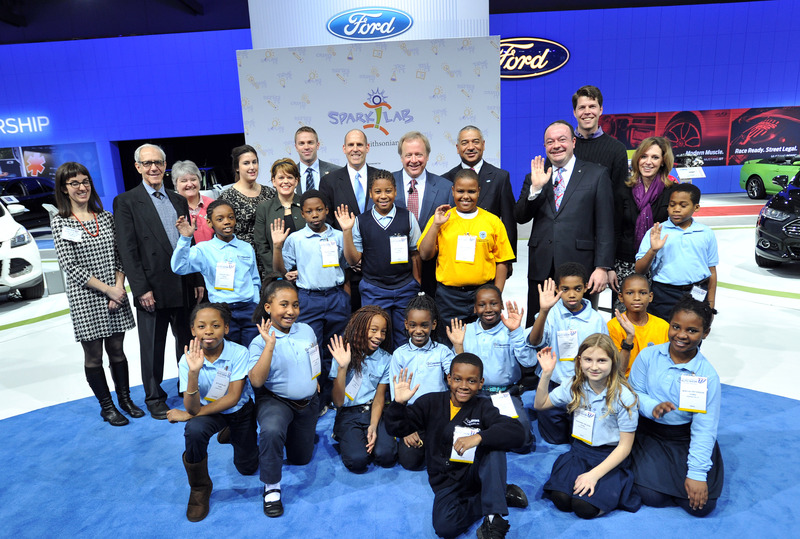 Edsel Ford pictured here with Ford Motor Company Group Vice President of Government and Community Relations Ziad Ojakli (standing third from right), Vice President of Sustainability, Environment and Safety Engineering Robert Brown (standing between Ford and Ojakli), representatives of the Smithsonian, and fourth grade students from Cornerstone Schools of Washington, DC. 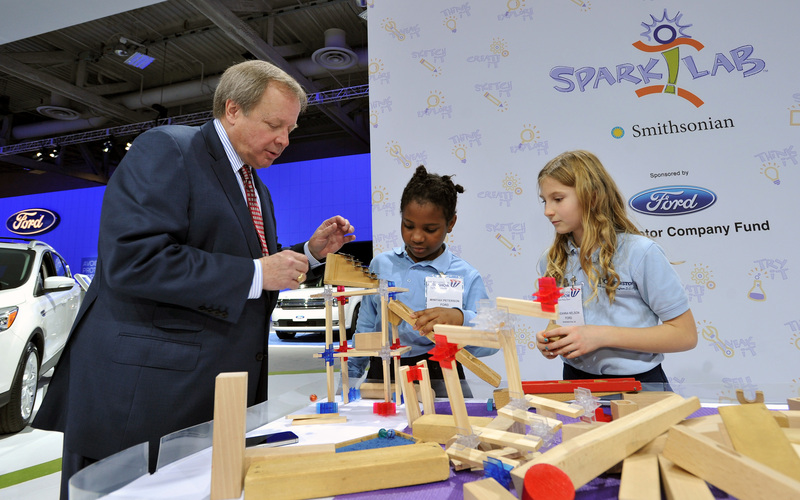 Photo by Sam VarnHagen/Ford Motor Co.
Edsel Ford II joins fourth grade students Miniyah Peterson (center) and Raeanna Nelson (right) from the Cornerstone Schools of Washington, DC, in a Smithsonian Spark!Lab activity creating a sound pathway for marbles. Photo by Sam VarnHagen/Ford Motor Co.
We’re now starting to come off cloud nine and begin the real work of identifying potential partner museums and developing content and activities for these new sites. We are thrilled to be able to take Spark!Lab to other communities, and to start to create a true network and community of educational practice around invention and innovation. We’re also excited to be talking about the Spark!Lab National Network to museum colleagues at two upcoming conferences—the Association of Children’s Museums InterActivity event in Pittsburgh in April and the American Alliance of Museums Annual Meeting in Baltimore in May. If you’re interested in learning more about the Spark!Lab National Network or bringing Spark!Lab to your community, let us know in the comments or email us at sparklab@si.edu!